A federal judge has issued a couple of orders in North Carolina's legal wrangle with Alcoa over ownership of the bed of the Yadkin River, in a prelude to a trial early next year. The aluminum giant and the state, you'll recall, have fought for years over renewal of Alcoa's hydroelectric license for 40 miles of the Yadkin east of Charlotte. The state has argued Alcoa doesn't deserve free access to the state's resources after shuttering its Badin smelting plant. Things got more interesting when North Carolina asserted that the state, not Alcoa, owns the riverbed under the Yadkin. Alcoa, which dammed the river nearly a century ago, claims it has longstanding title. U.S. District Judge Terrence Boyle issued an order Thursday on motions for summary judgment from both sides, granting some and denying others. He instructed both sides to be ready for trial on Jan. 15. Ryke Longest, director of the Environmental Law and Policy Clinic at Duke University's law school, said Boyle made a couple of noteworthy decisions. Longest represents the Yadkin Riverkeeper, a former party to the case. Most importantly, he said, the judge granted North Carolina's motion that it made a prima facie -- correct until proven otherwise -- case for ownership of the riverbed. That shifts the burden to Alcoa to prove at trial that it holds title. Boyle denied Alcoa's claims that the company owns the riverbed by virtue of its long occupation there. He also ruled against Alcoa's argument that the river was not navigable at the time North Carolina became a state. States own the beds of navigable rivers, other courts have held. In a second order, Boyle denied Alcoa's motion to strike the affidavits of four expert witnesses for the state, meaning they will likely be able to testify at trial. "What it means is we're going to have a very interesting trial starting in January," Longest said. North Carolina's Environmental Management Commission has approved long-overdue water quality standards that stiffen limits on metals, which can be toxic to fish and other aquatic life. Federal law requires the updates every three years to recognize research on pollutants' effects. North Carolina is four years late, a delay state officials blame on the complexity of the standards and policy changes that made it harder to enact new rules. The changes won't take effect until the Environmental Protection Agency approves, and EPA has already signaled some concerns. The standards include a provision called the "biological trump" that allows some concentrations of metals to exceed the limits if there's no evidence aquatic life has been harmed. EPA says biological studies are of little use in preventing water pollution and don't replace the need to enforce pollutant limits. We'll update when EPA rules. The Southern Alliance for Clean Energy and its partners have added an interactive tool to their website about the 450 coal ash ponds spread across nine states. The site can now generate power plant-specific reports with data on coal ash capacity, dam hazard ratings and known contamination. The feature was added as the Environmental Protection Agency prepares to release the first federal rules on ash in December. The agency's key decision will be whether to regulate ash as hazardous waste. EPA rules to be released next September, on wastewater discharges from power plants, could also limit use of ash ponds. The coal-intensive Southeast was the scene of the two spills that drew federal attention to coal ash regulation -- the first by the Tennessee Valley Authority in 2008, followed by Duke Energy's spill into North Carolina and Virginia's Dan River in February. The alliance worked with Appalachian Voices, the North Carolina Conservation Network and the Southern Environmental Law Center on the site. North Carolina ranked 10th nationally for clean energy and transportation jobs in the second quarter, the business group Environmental Entrepreneurs said Thursday. A report from the group says 272 new jobs, highest among states in the Southeast, were created by four announcements in the state. The 12,500 jobs created nationally more than doubled the results from the first quarter, the group said. It attributed that to "new confidence about future clean energy growth" linked to the Environmental Protection Agency's carbon limits on power plants, announced in June. Solar energy led all sectors with 5,300 U.S. jobs in the second quarter, followed by 2,700 in wind and major electric-car announcements by Tesla and General Motors. Arizona led all states in new jobs, followed by California. The Environmental Protection Agency has added to North Carolina's list of polluted waterways, saying the state should have included 52 more bodies of water than it did. States have to update the so-called 303(d) list of impaired waters every two years. But EPA objected to new methodology the state Environmental Management Commission adopted to update this year's list. EPA added back to the state's list 52 river and stream segments that are impaired by metals, which can be toxic to fish and humans. The additions include Mecklenburg County's Irwin Creek, where the water contains lead and zinc. EPA spokeswoman Dawn Harris-Young said adding to a state list is "not common, but it is not an unusual occurrence." EPA added one segment to North Carolina's 2012 list, state officials say. The state environment commission last year raised the bar for proving that waterways are impaired. Under the old standard, more than 10 percent of water samples had to show elevated levels of contaminants to be deemed impaired. The commission added a requirement that sample results be shown to be accurate at a 90 percent confidence level. Establishing that confidence level meant analyzing more water samples. The N.C. Division of Water Resources moved some water bodies, for which it lacked the additional data, from "impaired" to "inconclusive." The EPA objected, adding those waterways back to the list. It will take public comment on the additions through Sept. 12 -- email hopkins.marion@epa.gov. EPA approved the state's listing of nearly 1,200 water bodies as impaired, and the removal of 227. The North Carolina Wildlife Federation has announced the winners of the annual Governor's Conservation Achievement Awards. The federation has presented the awards since 1958. This year's awards will also induct environmental philanthropist Fred Stanback of Salisbury into the Conservation Hall of Fame. Stanback previously was named Conservationist of the Year in 2005. Marine Fisheries Enforcement Officer: Sgt. Carter Witten of Havelock for leading special enforcement projects in Eastern North Carolina. Several environmental groups wrote N.C. Senate leader Phil Berger and House speaker Thom Tillis on Friday to complain about the coal ash legislation now before a legislative conference committee. Legislation adopted by both chambers sets Duke Energy on a 15-year timeline to drain each of its 33 ash ponds in North Carolina. Differences between the two include House changes that allow extensions to the timeline and changes in how groundwater contamination is defined. Neither says whether consumers would pay to clean up the ponds. House and Senate members say their work puts North Carolina at the forefront of states in dealing with ash and predict it will serve as a national cleanup model. But the environmental groups wrote that "the current legislation inexplicably attempts to weaken our state's existing groundwater protection laws in favor of Duke Energy while allowing Duke to continue polluting state waters and putting our communities at risk." The letter was signed by the Southern Environmental Law Center, which represents groups in litigation against Duke, and representatives of 11 advocacy groups including Charlotte's Catawba Riverkeeper Foundation. Ash is required to be removed from ponds at only four of Duke's 14 coal-fired power plants in the state. The groups say ash could stay in place, near water it could contaminate, at the remaining 10 plants. House members inserted language they said was intended to prevent over-broad interpretations of a judge's order this year that state law requires "immediate action" to eliminate sources of groundwater pollution. Advocates say the change "is a clear effort to gut that requirement." The bill allows Duke the option of bringing unpermitted leaks from its coal ash dams under existing permits. "In short, the bill as written actually weakens North Carolina's protections against coal ash pollution, which is alarming given the recent disaster at the Dan River facility and frequent assurances that this bill would provide strong protections for our citizens," the groups wrote. "It is not too late to make good on those promises." Rep. Chuck McGrady and Sen. Tom Apodaca, both Republicans from Hendersonville, are the respective leads for ash legislation in the House and Senate and are expected to try to arrive at a compromise bill. No word when it will appear. Public comments favor, by a wide margin, a ban on hunting coyotes in red-wolf territory as the N.C. Wildlife Resources Commission meets Thursday to discuss the issue. In May a federal judge ordered the state to end its open season on coyotes in the five coastal counties -- Dare, Tyrell, Hyde, Beaufort and Washington -- roamed by the rare wolves, which resemble coyotes. Temporary rules the commission has proposed put the injunction in effect. Rising numbers of gunshot wolves, often when they're mistaken for coyotes, threaten the species' survival on the Albemarle Peninsula of northeastern North Carolina, federal biologists say. Between 90 and 110 wolves live in the area. Public comments the commission solicited found that 3,108 agree with the ban and just 69 disagree. That doesn't count form letters from members of the Southern Environmental Law Center, whose clients sued to stop coyote hunting, and Safari Club International. More than 40 people submitted comments at a public hearing in Columbia on June 19. The rules would take effect Aug. 1, but U.S. District Judge Terrence Boyle has said he would revisit his injunction six months after he made the ruling. Are insect-ravaged hemlocks at a tipping point? 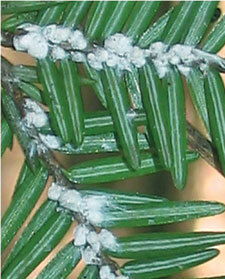 A Japanese insect called the hemlock woolly adelgid has devastated Southern Appalachian hemlock forests, but apparently not to the degree expected, new research shows. The U.S. Forest Service released a study Wednesday that says the majestic trees might still be growing fast enough in the East to offset the insect's damage. The adelgid was first spotted in Virginia in the 1950s. By 1980, damage had begun in the hemlock's Appalachian range running from northern Georgia to Canada. Trees were hit hardest in the South, where mild winters don't help limit the insect's spread. Lead author Talbot Trotter, an ecologist at the service's Northern Research Station in Pennsylvania, says the study might have captured a tipping point between hemlock losses and increases due to forest regrowth. The study used forest data only through 2007. "Repeating this analysis as new (forest) data becomes available may show if we are beyond a tipping point and are now losing hemlock," he said. -- Gasoline prices are expected to trend downward over the next two years, averaging $3.46 per gallon in 2014 and $3.39 per gallon in 2015, as U.S. crude oil production grows and crude prices fall. -- U.S. crude oil production could set a record in 2015 with the highest output since 1972. Production is projected to rise by 1 million barrels a day this year to 8.5 million barrels, and then rise to 9.3 million barrels per day in 2015. Imports would drop to 24 percent of total liquid fuels consumption, the lowest level since 1970. -- Onshore natural gas production will continue increasing over the next two years, with the Marcellus Shale of eastern North America offsetting declines in the Gulf of Mexico. -- Average household electricity use is expected to decline 1.1 percent this year and another 0.4 percent in 2015 due to improved appliance and lighting efficiency. Dropping household use will be offset by increased demand from industries. -- U.S. wind power capacity is forecast to increase 8.8 percent this year and 15 percent in 2015. But utility-scale solar capacity is expected to zoom up 40 percent between now and the end of 2015.